Heat pump system installed behind the former Dewitt Park Inn. If a contractor told you there was a way to take heat out of the air in the middle of winter and pump it into your building to keep it warm and, with the same equipment, take cool air from the outdoors to cool your building in the middle of summer—you’d probably roll your eyes. However, it’s not only possible, it’s happening in homes and businesses across our region. Heat pump technology essentially uses the same process that your air-conditioner or refrigerator does. Heat pumps transfer heat from indoor spaces to the outside during summer months, and they can be reversed to pull heat from the colder outdoors during winter months to warm the interior, providing whole-building air conditioning and heating at a very affordable price. According to the U.S. Energy Information Administration, space heating accounts for about 42% of energy use in residences and about 36% of energy use in commercial buildings in the U.S. This means that homeowners spend an estimated $73 billion (29%) of their total energy-related expenditures on space heating alone, while commercial buildings spend more than $27 billion (15%) annually. Heat pump systems are so efficient that they save home and business owners significant amounts of money. Because a heat pump moves heat rather than converting it from a fuel like combustion heating systems do, they can deliver one-and-a-half to more than three times more heat energy to a building than the electrical energy it consumes. In the Finger Lakes region, geothermal systems—which use the fairly constant ground temperature to provide warmth in the winter and cooling in the summer—have dominated the heat pump market because until just a few years ago, air-source heat pumps didn’t work very well in typical winter temperatures. However, in the past couple of years, heat pumps that can pull a significant amount of heat from air as cold as -5°F have become commonly available, and there are even systems able to work at temperatures as low as -13°F. There are three significant differences between conventional and ductless mini-split air source heat pumps. The first is that ductless mini-split units do not need to be connected to an indoor system of air ducts that distribute the conditioned air to each room of the house as conventional heat-pumps do. 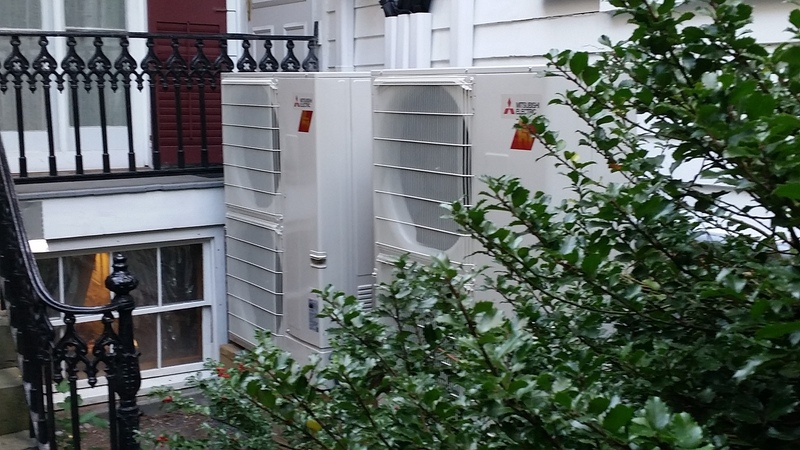 Similar to mini-splits, conventional heat pumps have an outdoor compressor and heat exchanger tied to an indoor heat exchanger via refrigerant lines. But the similarity ends there. With traditional heat pumps, the indoor heat exchanger is located within a portion of the furnace air handling system, which in turn is tied to a whole house system of duct work. While the refrigerant is responsible for removing the heat from the house, a powerful fan is needed to force air through the duct system to distribute the cooled air throughout the house. With a mini-split system, relatively small-diameter refrigerant lines connect the exterior compressor to a series of indoor heat exchanger “heads.” A typical commercial exterior mini-split unit can handle up to about 25 interior heads. Eliminating the need for duct work means that it becomes possible to cool existing buildings that do not have a furnace and the accompanying whole house system of duct work, such as those heated with a boiler. Prior to the introduction of ductless mini-splits, owners of houses without furnaces who wanted the efficiency and comfort of central air needed to retrofit their buildings with an air handler and duct work running to each room. This is difficult and also extremely expensive to do. The other option was to use several window AC units to cool the building—which is much noisier and also much less efficient than heat pumps. The second significant difference between mini-split and conventional systems is that mini-splits make use of a technology called variant refrigerant flow. When conventional heat pumps are on, the system runs at full speed, regardless of the load on the system. When the heating or cooling load is satisfied, the unit switches off. The ability of mini-splits to run at variable speeds, with the speed being set automatically based on the cooling or heating load on the system, is another factor that makes mini-splits significantly more efficient than conventional heat pumps. A net zero-energy building balances the annual amount of energy it consumes for space heating, water heating, powering lights and electrical appliances with the amount of energy created on-site with a renewable energy system—solar PV panels or wind turbines, for example. By combining the attributes of the low heat load of a super-insulated building with an air-source mini-split unit capable of pulling heat from very cold winter air coupled with a correctly sized on- or off-site renewable energy system allows buildings, even in cold areas of the country, to achieve net zero-energy consumption. Part of the beauty of this method is that by spending some extra money to super-insulate the building (R-40 walls, R-60 roof), an expensive central heating and distribution system is not needed. Ductless mini-split systems are much less expensive than typical fossil fuel-fired central heating systems and a fraction of the cost of ground-source heat pump systems. Ductless mini-split systems, coupled with a super-insulated building are making the construction of net zero-energy homes and businesses cost-competitive compared to a typically constructed building, with enormous energy and cost savings over time.